i gave up on the practice of making resolutions many New Years ago, as it tends (more often than not) to mean setting one's self up for failure. how many times have you found yourself, on the eve of a new year, vowing to give up some thing... only to end up disappointed in yourself a few days (or hours) later? then you give up on the giving up, get mad at yourself, and stop trying. exactly. no more resolutions for this girl. what i prefer to do is to set myself a very vague (highly guilt-free) goal of either trying something new, or getting back to something that i may have done in the past. one of last year's goals, for example, was to knit more things. anyone who follows me with any regularity, all two-and-a-half of you, might wonder where the "new" is in that, as i am always talking about knitting. the goal was to go from simply knitting out of sheer curiosity (which usually resulted in the project being unraveled once said curiosity was satisfied) to actually working toward completed objects that i would actually want to have in my home and wardrobe. i completed a grand total of ten garments last calendar year (two of which were for him), and—far more importantly—i have actually worn most of them. the experience was so fulfilling (not to mention, confidence boosting) that i intend to continue on filling my wardrobe (and his) with hand-knitted things. i have two sweaters currently on the go, with about a hundred more items that i absolutely want to start working on soon. at this rate, i will have to live a few more lifetimes to get through all those future projects. luckily, all that planning is half the fun. so, in addition to some more personal objectives (being more patient with the world around me, for example), i have set myself a couple-few crafty goals for the year ahead. i want to get back into sewing, though i have not really found the right assortment of patterns or ideas to set that particular flame alight. however, there is one wholly-absurd fire that has being going for some months now, and i think it is finally time to make it happen. i speak (naturally) of candle-making. this is one of the countless crafts i did back in my botanic garden days, where my job included teaching not only outdoor gardening classes, but also a wide range of indoor crafty activities for the whole family, especially in the colder part of the year. 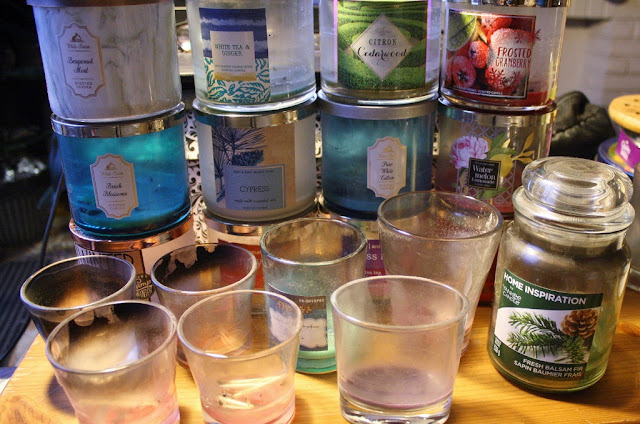 i had been saving empty candle jars for a few months, with no particular plan in mind, when it occurred to me that i could clean them out and refill them at a fraction of the cost of buying more candles. me: i just remembered that i used to teach candle-making workshops at the garden. it's really easy to do. don't know why i am letting all these random websites turn it into a complicated activity. 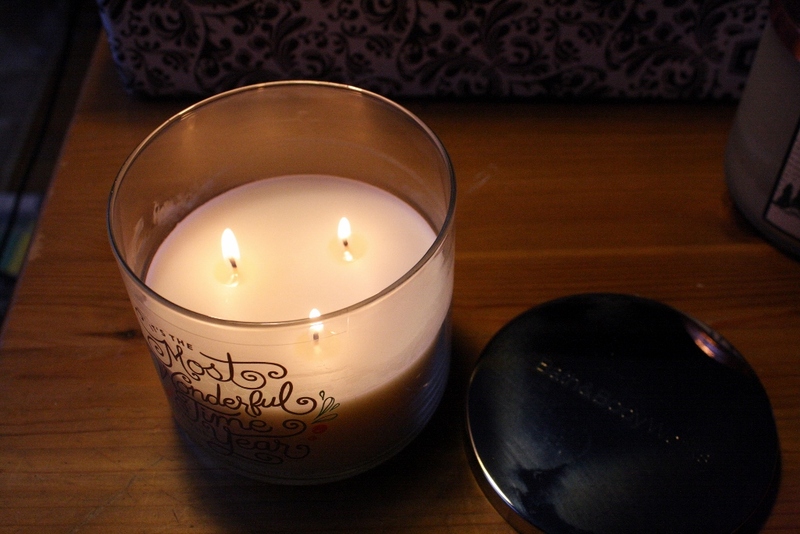 i can make candles with my eyes closed. him: how do you even forget something like that? me: i taught a lot of really wacky classes while i was working there. it's hard to keep them straight. however, if you ever want to recycle old jeans into handmade paper embedded with flower seeds, then turn that paper into greeting cards that can be planted directly into your garden to form a flowerbed... i'm your girl! him: i'll keep that in mind for after the apocalypse. i was all ready to venture off into the world of candle-making, when Bath & Body Works decided to have one of their big semi-annual sales. i only ever buy their stuff during the big June and December sales, and i only ever buy two things—three-wick candles and body creams, both in assorted season-appropriate fragrances. so, i used that opportunity to purchase some of their Wintery candles, and the candle-making adventures was quickly forgotten... until a few days ago. i am not a fan of overly-sugary smells, so i tend to stick to the deep, woodsy, spicy (cinnamon, cloves, that sort of thing) fragrances in the Fall and Winter, and fragrances that are more reminiscent of gardens and outdoor spaces (grass, flower blossoms, that sort of thing) come Spring and Summer. i was standing in front of my current stash of candles, deciding which one to burn next, when i sought the advice of my favorite animator. him: read me the names of the ones you have now. him: go with that one. him: what's wrong with that one? you like that one. you buy it all the time. 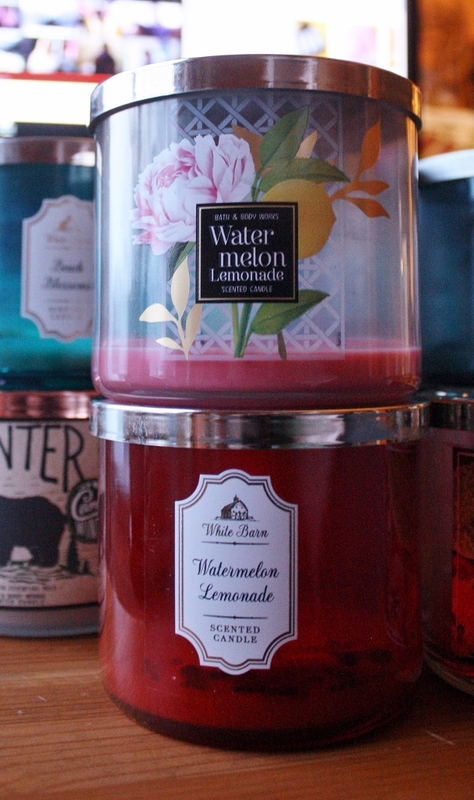 me: sweetie, you don't burn watermelon-lemonade in mid-winter. that is a sacrilege. 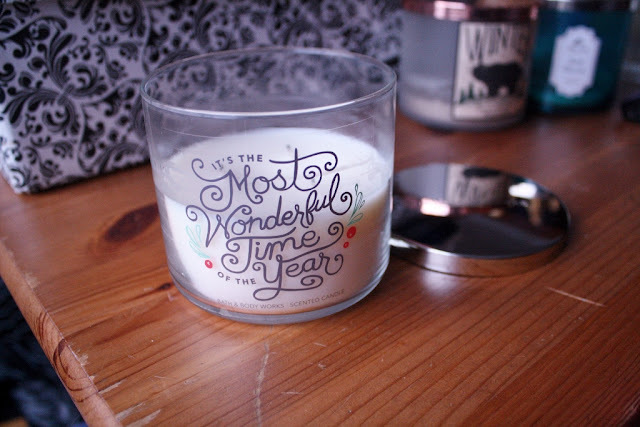 him: that is the best-smelling candle you have ever gotten. ... and i was forced to agree. it smells like a freshly-cut pine tree. no unnecessary flowery or fruity notes... just pure Christmas tree. i immediately hopped on their website in hopes of finding a few more, but they were already gone, so hopefully they will bring this one back next year later this year. 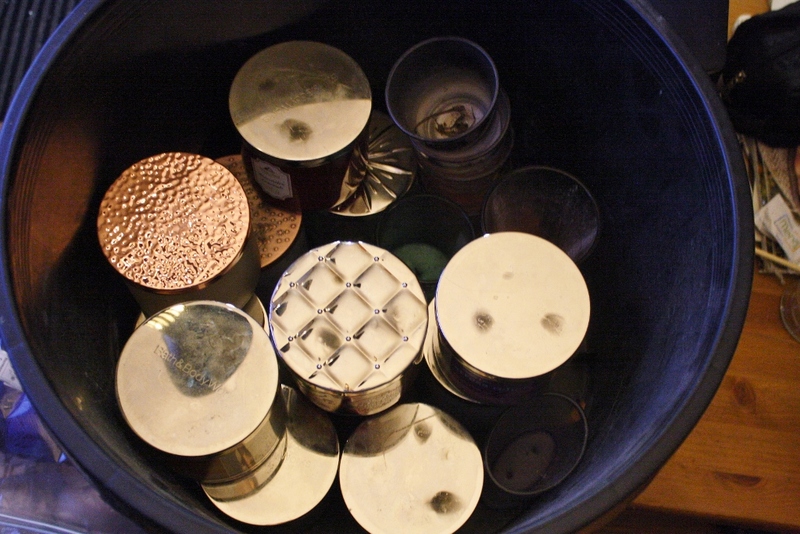 so, while i was basking in the glow of the most wonderful fragrance ever, i renewed my excitement to get going on the candle-making adventure some time during this year. all i really need are some wicks, wax pellets, and fragrance oils to scent my candles as i see fit, and i am ready to create! i have a dozen empty three-wick candle jars, plus some assorted smaller jars from candles i purchased elsewhere. when someone offers to show you their empties, you usually expect something a bit more exciting than this. note the two Watermelon-Lemonade empties, and i still have a third (unlit) candle in the utility closet, waiting for watermelon-lemonade weather. apparently i really do like that particular scent. the empties currently live in a large twelve-gallon garden container, like the ones we use for the balcony garden. we purchased a dozen for said project, but i managed to pinch two of them for other purposes. one currently sits on the floor near my favorite sofa, overflowing with bags of yarn, while the other one has been pressed into service housing my (growing) collection of candle jars. i also have this jar from a Yankee Candle i purchased at my local Bureau en Gros (which is what Staples is called when you live in a place that insists on using French as its first-language). 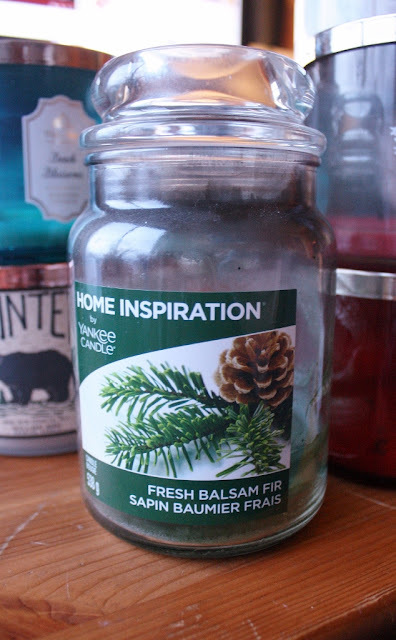 i love love love that fresh balsam fir candle because the scent of it reminds me of all those wreath-making workshops i used to lead during the holiday season. and, yes... that was also back when i worked at the botanic garden. that place really has ruined me for life.